Download DA Form 833, also known as License To Use Army Reserve Facilities. 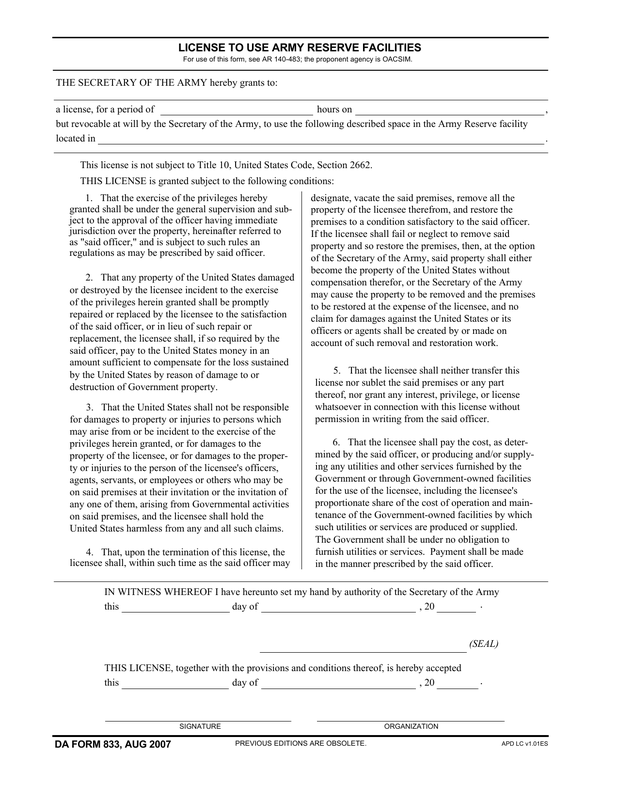 This form is used as an agreement to use Army facilities for a limited amount of time on a specific date. The agreement outlines what is allowed while one is in possession of the facility and what is disallowed. Agreement must be signed and agreed to before an Army notary public before use of the facilities will be granted. Step 1- Under “The Secretary Of The Army hereby grants to:”- the user’s name would be placed on the line. Step 3 – Read the numbered paragraphs prior to signing the agreement. 1. This paragraph states that the license will be granted under the supervision of and will be approved by the officer who will have jurisdiction of the property. Renter must adhere to all rules and regulations that the deciding officer prescribes. 2. This paragraph addresses damages caused while in use, the officer will have repairs made that will be to the satisfaction of the Army. The licensee will be charged for any damages, if any. 3. This paragraph addresses responsibility to the licensee in the even of damages or injuries to any officers on the premises by invitation or otherwise, the licensee agrees to hold the United States harmless of any injuries at any level. 4. This paragraph addresses restoration of the licensed property once the event is over and is vacated. All property must be removed, the premises must be cleaned and left as it was found. If property is left behind, the Secretary of the Army will decide if the Army will take possession of your property without compensation or if it will be removed and disposed of, with no claim of responsibility to the Army. If the property has to be restored to it’s original condition, it will be done at the expense of the licensee. 5. This property is not to be sublet without written permission from the officer. 6. The licensee will be responsible for all cost involved in rental of the property to include any use of utilities while the property is rented. This will include any maintenance to restore the facility if needed. The officer will decide the cost of the rental and how and when it shall be paid. This document must be signed and witnessed before a notary of the U.S Army. This form is fillable online or printable for manual use and/or sending.